RuPaul’s Drag Race crowned a winner but it also proved that the show has some major legs. In six seasons, the series has seemed to grow exponentially. It’s found an audience outside the LGBTQ community. It also seems to be conquering pop culture, social media, and the world at large. RuPaul has used his stardom to provide a platform for drag and transgendered performers to find mainstream success. Here are some of the best moments from the finale. 10. Production Values, Hunty! There’s elaborate choreographed dance and singing numbers in a huge arena. This is a huge departure from a show that started in a tiny little studio. It has evolved into a phenomenon that took over the Internet with a huge social media presence. Not only did the finale get filmed in a huge elaborate ceremony, there was an additional ceremony to crown the winner the day of. Everyone knows they film all three queens winning to avoid spoilers. 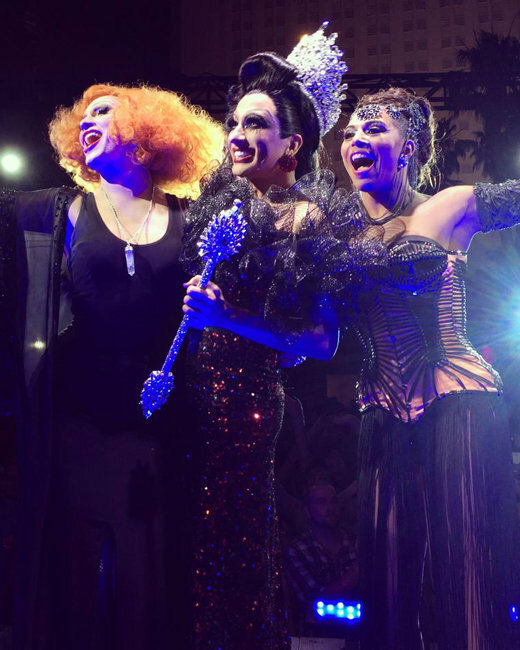 This year, there was an elaborate coronation ceremony for winner Bianca Del Rio hosted by Shangela. 8. Ornacia Heads. There were four dancers doing elaborate dance breaks. The best one had to be dancing with Ornacia heads and even voguing. 7. The Fake Housetears of Drag Race. Adore Delano and Laganja Estranja have a tearful heart-to-heart while watching their fight on Untucked. 6. Michelle Visage Is Unimpressed. Michelle was caught looking unimpressed in the audience. It became the meme that stole our hearts on the LogoTV Tumblr. 5. The Coronation of Miss Congeniality. Ivy Winters came out on stilts to give BenDeLaCreme the award! Dela did earn it… she stole the show with her effervescent personality. 4. Darienne Lake Reunited. Darienne was a bit outspoken with a bit of a Bitter Betty vibe. However, she was a sweetheart and got everyone crying when RuPaul reunited her with her estranged parents. 3. Josyln Fox’s Wedding. Fox was proposed to on the show. With RuPaul an ordained minister it certainly was possible. However, there was not a dry eye in the house. Even their mothers were in the house for the special moment. 2. Bianca Del Rio Crowned. Bianca Del Rio, Full of Hate, Congratulations to thee. Jinkx Monsoon crowned Bianca and then Bianca gave such a heartfelt acceptance speech. There was even a random appearance by Judge Judy to congratulate Bianca. 1. The Future. This show proves the legitimacy, not only of drag, but of a show that targets the LGBTQ community. Jinkx Monsoon found success on Broadway after the show. Bianca is planning to make a film Hurricane Bianca and Adore and Courtney Act have both recently released songs.